Last week I wanted a quick and easy soup, but something that would still have great flavors and taste like it simmered all day. 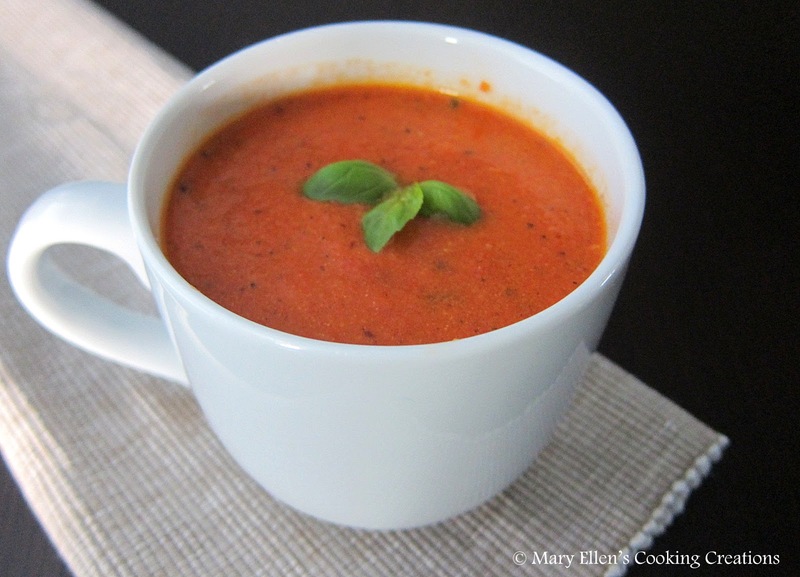 I usually turn to this Roasted Tomato Soup - it's a great soup, doesn't have any cream, but it requires roasting your own tomatoes. I know, not a big deal, but I had a little one running around and wanting my attention. I bookmarked this recipe from the blog Coffee and Cannolis as soon as I saw it. The title of it sucked me in, and then I saw that it was a really easy recipe and something I could quickly make with a 2 year old running around. I was sold! This soup was delicious! It was a touch tangy, so I think next time I'll add some carrots to cut the acidity. But overall it was really good, and had a nice kick which I love. In a heavy bottomed pot over medium high heat, saute onion in olive oil until translucent. Add the garlic and saute with the onion for 2 minutes. Add the tomatoes and crushed red pepper and their juice to the pan and cover for 15 minutes, stirring as needed. Add the chicken stock and half of the basil and bring to a simmer. Cook uncovered for 10 minutes. Using an immersion blender, puree until there are no large chunks of tomatoes (or transfer to a blender and puree in batches). Return to heat and add the rest of the basil and the half and half or light cream. Heat until warmed through. Serve immediately. This soup got even better the next day, so I'd recommend making it the day before you plan on eating it. Some homemade croutons would be great with this soup! Glad you liked it! And I love your suggestion for carrots. Hopefully I'll get that immersion blender for Christmas and then I'll make this again soon!